The final item for my Pattern Review 6-in-6 Wardrobe Contest Entry is done! And it’s jeans! This is my first time making jeans, even though I wear RTW jeans almost every day. I have to admit, it was super fun! I’m overall really pleased with how these turned out. There are a few things I’ll tweak for next time (oh yes, there will be a next time), but I am stoked with how well the first attempt turned out. I think the color is great, and I’m really excited with how well these fit in with my whole Hunchback inspired spring Sew Geeky plans, plus I think they are the perfect piece to add to my mini 6-in-6 wardrobe. I’m getting them in just under the gun (the contest ends in 2 days), but it was so worth it! The front! I think the fit is pretty good here. Looking good from the sides! The back! The pattern does say to expect wrinkles below the bum, but I think I could do a bit better. Might try some fit adjustments in the future. The guts! I used a purple contrast thread in the serger and a fun print on the pockets. Wardrobe Contest Notes: I made this as the second of the two bottoms for my Wardrobe Contest Entry. I had decided last year that I would try to create seasonal wardrobe capsules as my sewing plans for the year, each one inspired by a Geeky fandom of mine. My spring inspiration is The Hunchback of Notre Dame, which was one of my favorite films and books growing up. I wear jeans all the time, so I really wanted to make jeans as a versatile wardrobe piece for my collection. I decided to use my embroidery machine to embellish the back pockets, to tie a rather basic garment into the theme of the whole wardrobe. I also used a somewhat untraditional color (teal) to coordinate with my other pieces. Pattern Description: Women’s skinny jeans in low rise and high waisted variations. I made view B, the high waisted skinny jean. Pattern Sizing: Closet Case sizes 0-20. I made a size 12 at the waist, graded out to a 14 at the hips, and a 16 at the full thigh and full calf. Were the instructions easy to follow? The instructions are great, especially if you’ve never sewn jeans before (this is my first pair!). I really like how it tells you when to finish off seams, and I find the order of construction to be very good and easy to follow. 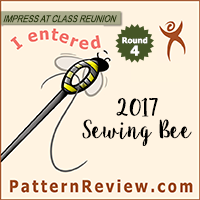 I also like that there is an online sew-along with photos – it was great to be able to cross reference the material in the instruction book with the photos online. The only step I wish that I had NOT followed precisely was the instruction to base the back pockets in place – I had to move the pockets quite a bit and my baste line is clearly visible, unfortunately. I should have just waited, then held the pockets up and pinned them on. I am glad, though, that it instructs you to fit the back pockets before doing all the topstitching. Ripping that out would have been a pain. Did it look like the photo/drawing on the envelope once you were done with it? Yes, I think it is pretty close. Obviously, I didn’t go with a traditional color of denim or a contrasting topstitch, but overall I think the result is very close to the drawing. What did you particularly like or dislike about this pattern? Likes: The fit was pretty great right out of the envelope for me. I’m sure I can make some tweaks before my next version, but on the whole I think the fit is pretty good. I like that there are two waistband height options in the envelope. I also like that the pattern is specifically sized for stretch denim and that she indicates that you should aim for 1” of negative ease in fitting, and that online she has the full finished garment measurements, which helped me know to grade out to a 16 at the thigh, even though I am only a 14 at the hip. I like the waist stay drafted as part of the pockets in the front, and I really like the instructions. On the Nettie the instructions felt a little too friendly and hand-holdy. Here, they were more cut and dry with a few cheerleader moments after major sections, like installing the fly front. The instructions ended up being very comprehensive, which was great because it made the process very straightforward. Dislikes: I think the back pocket might be slightly large for me, and I wish the front pockets were a bit deeper. Also, I love where the waistband is when I’m standing, but I think it could be more comfortable for sitting. in the next version I think I might raise the back waistband slightly and lower the front slightly. Fabric used: A teal stretch denim from Fabric Mart from eons ago. It is oddly stiff in the straight grain but really stretchy on the cross grain. I’m sort of wondering if this is the cause of all the wrinkles at the knee? I’ve been wanting to make jeans for ages – I’m so happy I’ve finally done it! I’m sure there will be more popping us soon (especially since I’ve got purple and red denim in the stash). I used a quilting cotton from the stash for the pockets. The thread, topstitch thread, and button were also all from the stash. I interfaced the pockets with medium weft interfacing, and the waistband with tricot interfacing because I did not want to lose the stretch. Construction notes: Since jeans require a few extra things I thought I’d include some notes on construction. Obviously, I followed the Closet Case instructions to the letter the first time through, but she does give you some options for construction techniques. I chose to go with the stitch and serge method, in part because I wanted to have a fun purple contrast on the inside, and in part because I thought it would be less bulky than attempting a flat felled seam, and I was a bit nervous about using my top-stitch thread on a flat felled seam. I’ve never had much luck using proper “top stitch” thread as it is so thick, but I did have Gutermann Mara Tex 30 in the stash, which is a thicker thread, but not quite as thick as proper topstitch thread. I was a bit nervous because I have a WIP/UFO that did not take the thicker thread at all (like, it literally didn’t even puncture the fabric), but I’m coming to realize that may have been the fault of the fabric, because the Mara Tex 30 worked great as a topstitch thread for these jeans. I also decided to use embroidery on the back pockets. Because this fabric was so stretchy, my first design was a total fail. The thread density was too much, and resulted in wrinkling of the denim. I think it would work much better on a non-stretch woven, as my muslin test-stitch was great. So I went with a much less dense fleur-de-lis line art style from Urban Threads. I used poly embroidery thread because I wanted it colorfast, especially on a high impact area like the bum. Aside from the pocket embellishment, I had to move the pocket placement up by about an inch, and more towards the center by about an inch. Not really sure what this says about the shape of my bottom as compared to the draft of the pant, but it was a pretty significant translation. As fas as the front goes, I tried really hard to get a very square waistband in front, but it just wasn’t cooperating. And, despite testing perfectly, the thicker thread did not want to cooperate with the buttonhole on my actual waistband. Why it was perfectly happy bar tacking belt loops, which were even thicker I have no idea. Also, as a side note, I seem to be allergic to the button attachment. I’ll have to rig a cover-up so that it doesn’t rub my skin. Pattern alterations or any design changes you made: None, other than moving the placement of the back pockets. I basically made these jeans as per the instructions. I did not use the optional rivets at the pockets (a) because I didn’t have any, (b) because I wanted these to be as sleek as possible, and (c) I can have allergic reactions to metal on my clothes (as is apparently the case with the front button on these pants). I would consider adding them to a more traditional denim fabric in the future, but I think it might be difficult to find some that do not cause me to have an allergic reaction though. Would you sew it again? Would you recommend it to others? I am definitely going to make more jeans! I want to add the flare extension to the legs, and play more with embellishments, distressing, and hardware. Even if I use other patterns in the future, I’ll still likely refer to these instructions – they were great! 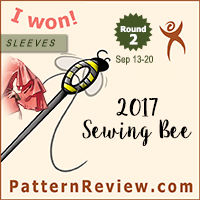 I highly recommend the pattern, especially if you are afraid to tackle jeans. Making jeans really wasn’t too hard – honestly this project felt pretty straightforward. It is a bit time consuming with the topstitching, but I found I actually really enjoyed the slow precision required to get a nice topstitch. The whole process went really smoothly (excepting a wonky buttonhole and not quite square waistband), and it feels great to know I have the skills to be able to make this sort of a wardrobe staple! Conclusion: I’m so excited I finally made jeans! It’s something I’ve been putting off for quite a while. I can’t say I’ve been afraid of jeans, exactly, but more that I keep finding other things I want to make first, and I do have a lot of RTW jeans already in my wardrobe. But now that I’ve made one pair I feel like I want to make more! The only thing I’m not 100% happy with on this project is the waistband – it’s not as comfortable when I sit as I’d like it to be, and it is the only bit of sewing that didn’t turn out as well as I’d hoped. I even ripped it out and re-sewed it a few times, but the front, despite my efforts, just ins’t quite as square as I’d like it to be. (Of course the underlapping band is perfect.) This isn’t a fault of the pattern – just not sewing as precise as I need to. I am, however, very impressed with my topstitching. I used a 1/8” grid food – it was perfect for this! I’m also really happy I went with embroidery on the back pockets – I think it might be my favorite fun detail. And I like the secret purple on the insides; it’s fun to have pretty details inside garments. So, in short, I really like these jeans! I don’t think they are my perfect jeans just yet (I’d like to adjust the fit of the waistband, and perhaps look at making the back legs less wrinkly), but for my first time making jeans I’m pretty pleased with with results. Plus, I think they are a great way to cap off the wardrobe contest entry – this is probably the most versatile piece in the collection, and I think it will prove to be quite useful in my wardrobe. Nice! I love the funky purple on the inside. I have the same ‘trouble’ you do-the sides and front look fine but the back is where I have issues. I love making Gingers. Rather than use topstitching thread, I usually just make an extra bobbin of regular thread and thread my machine with 2 threads. They look great. I usually just wind an extra bobbin of regular thread and thread the machine with 2 threads rather than use topstitching thread. Ah! Yes, I’ll definitely try that next time. I have so much trouble finding denim in Australia too! I’ve been looking for plain light-coloured denim for years without much luck. In response to the real post: These jeans look amazing! I had similar issues with the waistband being just not quite right, but I love your colours here and the fleur-de-lis pockets! Great review and great looking jeans. I love the colour and the embroidery / topstitching. Try painting clear nail polish on the metal where it touches your skin, to avoid allergic reaction. It works for me! Love the colour of these, I’ll have to look for coloured denim now! Oh outstanding job! There are so many people trying the Ginger Jeans, and it’s intimidating to see how many posts say to make like at least 5 muslins or something before trying to sew a pair. 😮 These look great on you! Lovely color, and great to see your tee’s with them… Full confession – the Ginger Jeans pattern is in my sewing folder (pdf) waiting for courage to show up. Yes – I definitely learned a lot, but now I’ve fallen down the rabbit hole of questing for the perfect jean! Congrats! The color is so special and fun. Excellent finish and fit and top stitching. Jeans are so fun to make and this color is fun so YAY!! They look really fantastic.